Last year some of you may remember I blogged about ‘Amazing what you can get for a tenner’. Hubby and I have a limit of £10.00 for each others Christmas presents. Yep no Radley bags or Pandora charms for me. We started our tradition around 4 years ago when we were saving to go to Florida, and we now do it every year. Its amazing how much thought you put into it with only a small budget. I am great at sourcing bargains, and this year he has a total of 9 presents to open on the big day, beating his 8 of last year. We do have some rules….. has to be EXACTLY £10.00. Not a penny over or under. I had 71p left but after much searching managed to find 2 items for 10p and 61p. The other rule is you can’t just go to Poundland and buy 10 items. 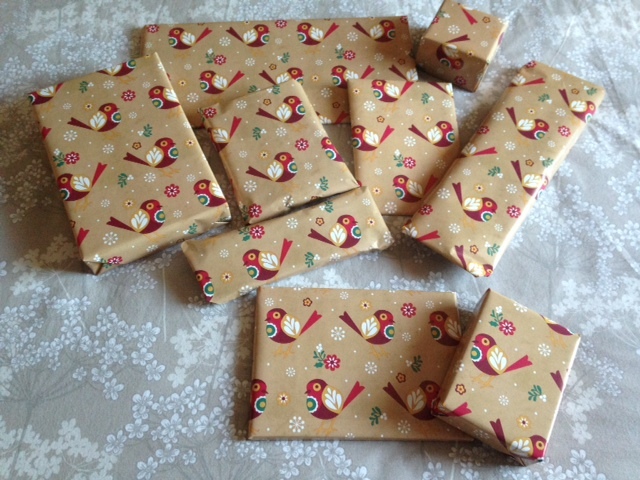 Presents are now all bought and wrapped as you can see below. Will do a follow up post after Christmas with all the shite exciting presents I got. Just need to work on the kids now and get them to agree to a ‘tenner Christmas’ !!! We do small and thoughtful gifts for each other although I’m not sure that I could do it for such a tiny budget! Wow! Hats off to you!